Ever since reading The 4-Hour Workweek by Tim Ferriss a few years ago I’ve been fascinated by the location independent lifestyle. It has occurred to me many times that, apart from the odd occasion I go to meet clients, I can pretty much do my job anywhere in the world. 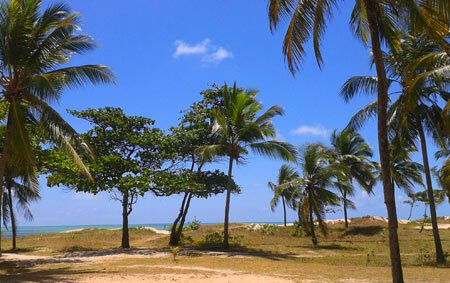 So, I’m writing this post from Recife in the northeast of Brazil! One of the many things I love about running my own design business is that I can work when I want. Now, I can work where I want. As we all know, perfect prior preparation prevents poor performance, and this is true of running your business abroad. In the video above you’ll see how I sync all my relevant files on two computers (my workhorse iMac and my MacBook Pro for travelling). I submitted a question on the Apple Support Communities and I got told about a neat free app called SyncTwoFolders which, er, syncs two folders. You don’t want to be endlessly copying over stuff from one machine to another and thinking to yourself “I’ve done work for this, this and this client, I need to copy this, this and this”. SyncTwoFolders automatically detects which files have been updated and which are new and copies only them. Of course, another solution would be cloud back-up which I didn’t go for as I have about 80GB worth of work. However, see below for the best cloud-based solutions. In the end I decided to take my trusty MacBook Pro and a small external drive to back it up while out in Brazil. This has worked really well and I have been able to complete client requests as I would have done normally. I did have, however, one complete disaster! TAP (Air Portugal) lost my luggage so my laptop’s adaptor was missing meaning I was without a laptop for days. So, the first bit of expert advice when travelling abroad whilst running your own business: carry all your essential items with you as hand luggage. This includes the laptop and the adaptor cable as well as other essentials. As explained above, I used SyncTwoFolders to copy my files across. But you have to remember everything, remember to install all the software on your laptop as you have on your computer. If there’s one thing you forget you’re bound to need it! Google Drive – great free service for upto 5GB. Download the app and then you can just drag and drop files onto a folder on your desktop and they’re backed-up. Don’t expect Google not to snoop on the contents of what’s on there, though! Dropbox – great user experience! Free 2GB. 500MB free per referral. Carbonite – Automatic, secure & affordable online back-up service for small businesses starting at $59/year. They have two week or one month free trial periods. BackBlaze – has free options but it can back up everything for $5/month, which is pretty awesome! Amazon S3 – not for backup but great for storage. Dreamhost – another great storage option is one of the hosts I regularly use, Dreamhost, they have unlimited bandwidth and space so you can just chuck a load of stuff up there you may need at some point. And they’re a great host! Disclaimer: some of the links above are affiliate links. One of the most important things when you’re going away is money. I find the best way to get money abroad is by withdrawing the maximum amount of cash from ATMs. This way you pay less bank changes. However it is also a good idea to let your bank and credit card company know where you’re going. These companies are very sensitive to fraud and if they suddenly see your card being used in a different location they can block it. This can leave you without access to your money when you most need it. In the video above I show you around the apartment I’m in now in Recife. I found the lovely apartment you can see in the videos through HomeAway.com (affiliate link). The great thing about the HomeAway site is that “Internet Access” can be specified when you’re searching (plus a number of other features like pool, satellite TV, etc., depending on your requirements). Book early to get a cheaper and the most direct flight. Make sure you’re only flying with one airline at a time. If you fly with multiple airlines on the same trip there’s more likelihood of something going wrong and then they’ll blame each other when it does. You think we spend time on social media to further our brand? Well, yes, but it pays to complain about an airline if something goes wrong on social sites. When thousands of people are aware of your complaint it’s amazing how much more receptive the company can be! Also in the podcast I mention the books that were recommended to me by my Facebook friends over at my Facebook page. Thrilling Heroics – Lifestyle entrepreneur & location independent digital nomad Cody McKibben on adventure travel, lifestyle design, freedom, remarkable living. Tropical MBA – Dan Andrews explains how to start and grow a global business from your laptop. This is also the home of two great podcasts. Why Brazil? 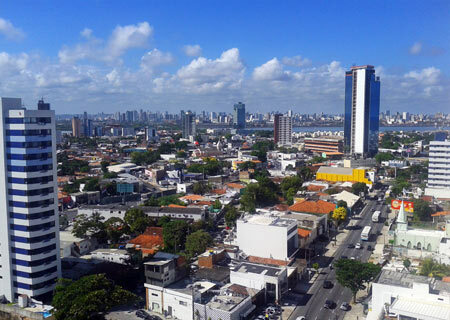 That has more to do with my personal connections here (I know people and I’ve been here to Recife before). Asia is a much better destination for digital vagabonding as it’s cheaper. However, Brazil is an exceptional country with bags of potential. I sometimes feel that Brazil has a great future in the same way as England has had a great past. I haven’t gotten involved in any specifically Brazilian projects since I’ve been here but I’m always on the look out! Traditionally when we go on holiday, we spend money and stop earning. Now, with a laptop, an internet connection and perfect planning, it is possible to run your business while on holiday. This can lead to a better quality of life for you and your family as well as more adaptability, flexibility and an increased global nature for your business. Great post Rob (and thanks so much for the mention! )….I hadn’t come across SyncTwoFolders before so thanks for the tip-off, i’m about to check it out. The tools you mention make life so much easier when on the road, and the added benefit is that most of them also have their own apps for iOS and Android devices so a lot of the time I find myself not even needing to use my Macbook Air as much as I used to when abroad. I can do almost anything from my iPhone/iPad (with some exceptions!) and access things that previously I could only do with a laptop. Hey, Suraj, great to see you here. Good point that many of these cloud solutions have their own iOS and Android apps. It’s interesting that you do so much on your tablet and phone. I still like to use a laptop (or even a desktop) as I like the big screen (it’s a designer thing). I actually surprised myself at how much more I am using my phone and tablet devices to run my business, not just when i’m abroad but also when i’m working from home. I find myself less reliant on my iMac and MacBook and feel that having access to almost everything from a mobile device actually gives me a huge benefit in terms of the lifestyle side of running my business. If i’m out waiting for a flight or a train, I don’t need to wait until i’m back in the office or have a platform to sit down and open my laptop (even though its only a MacBook Air!) to get some work done or do some of those tasks that traditionally I had to sit at my desk to do. On a recent trip to Dubai, I edited 3 of my vlogs using the iMovie app on my iPhone and uploaded them directly to YouTube from the app which saved me loads of time doing it later on from my laptop. This is obviously something I’m going to have to persevere with. I don’t have a tablet but I have an Android phone. I can see the benefit of answering the odd email or comment on the phone, but I can’t imagine editing a video in iMovie on such a small screen – that’s amazing! And, I’ve seen at least one of your vlogs from Dubai and they look fantastic. Another thing is the speed of typing. I’m not so good typing on a screen – especially a phone screen. OK, I can see I’ve got to be more mobile. You’d be surprised at how easy it is to edit a movie on iphone or ipad etc. It simplifies the process a lot compared to doing it on an actual computer. As for typing, as long as i’m in a relatively quiet place I now dictate almost all of my emails and messages using Siri/Dictation for Mac. It is incredibly accurate and saves me having to type all the time. In fact I’m dictating this sentence right now to finish off this comment on your blog which means my hands are completely free and I’m just talking into my microphone. I didn’t need to edit anything in that last paragraph – it picked up everything accurately. Sound advice Rob,not just for web designers. I’m a translator and I spent the whole of October in Texas, visiting relatives. I prepared for this trip much the same way as you did. It’s wonderful not being tied to our desks anymore, as we were in the olden days. Absolutely not just for web designers, Alexandra, in fact, I would say probably easier for you as you don’t have so much data to carry around with you 🙂 ! Great to hear you spent the whole month away and kept your business going. Could you do it for 2 months, 3 months, 4 months? That’s what I want to find out next year! Yes, I quite positive I could keep my business going if I went abroad for an extended period of time. Your plans sound exciting. Do keep us posted! Our little web site business ticked over well for 11 months in India. It’s not the same as it’s not our main income and we had someone back in London doing the hands-on stuff. We knew we going on a long break when we started our business so we took a Skype number for it so we could still take call and ring back (the UK) at local rate. On long trips I’ve always a had ATM problems. Sometimes the machines, but usually the banks taking no notice or what I tell them. I will say for Brits that Halifax Clarity credit card (not debit card) is great . No exchange charges, no daily limits and it has continued to work. Next time I am researching the electricity issue. Unlike US folk going to Asia the Brits are supposed to be OK with the minimal variation. I beg to differ. My various trips have now killed to laptop and two camcorders all suspected currency issues. David, thank you. Sounds like you’ve got a lot to teach me on this subject. I’m interested in that Skype number as it sounds like a good strategy (although I don’t get that many calls, the odd excellent client has come from an initial phone conversation). I’m used to a large monitor but I did OK-ish with my MBP. (I’m going to buy a new MBP or MBA – haven’t decided yet). Great tip about the card – silly question, do you have to open a Halifax account? Great points. All need to be discussed over a shandy. I knew I get ahead on at least one topic one day. Mind you not by much. On the Halifax credit card I made the mistake of opening a current account too thinking I could manage the credit card online better. No need. You set up a direct debit from any bank to pay in full (you end up paying 1% -2% ), but It is still the cheapest option. See here: http://www.moneysavingexpert.com/travel/cheap-travel-money. We watched the exchange rates to time withdrawals. It worked out better doing this than exchanging our cash over here through someone the locals use. Thanks, Marcus. Actually this is one of my favorite posts. It brings back good memories. And the video I made of going to the beach is one of my favorite videos even though it has zero value!